The avian CBC is a most important component of a diagnostic panel and the best indicator of a bird’s general health. It is the microscopic examination and evaluation of red and white blood cells that make up the cellular component of blood, and the results are an indicator of immune system activity. The volume, number, and character of the red blood cells per liter of blood. The numbers, percentages and characteristics of the white blood cells. A report of the relative numbers of specific types of white blood cells (leukocytes) in the sample. The concentration of solids in the plasma. The CBC is used to diagnose various blood dyscrasias (diseases or disorders), infections, and other abnormal body conditions. The average blood volume of most birds is about 10% of the body weight. When blood is used for testing, 10% of this volume (1% of the bird’s body weight) may be safely removed. New blood cells are generated every 4-6 weeks; if there is major blood loss, it can be replaced in a reasonable amount of time. In birds, mammalian neutrophils are replaced with heterophils, and platelets are replaced with thrombocytes. RBC’s are produced in the bone marrow and are oval in shape. If the bird is anemic (decrease in the normal number of RBC’s) and shows slight to no polychromasia (abnormal color of red blood cells) or anisocytosis (unequal shape and size of the red blood cells) over several weeks, decreased levels indicate that the bone marrow is depressed and not producing new erythrocytes. This is a serious condition. Polychromasia is a disorder in which the abnormal color of the red blood cells is a result of being prematurely released from the bone marrow during blood formation. The test for polychromasia measures the color variation among erythrocytes, indicating the hemoglobin content of the erythrocytes. This is usually slight. Anisocystosis is a disorder in which the variations in size and shape of the erythrocytes indicate anemia or other blood conditions. The test measures these variations, which are usually slight. Most erythrocytes are mature in the sample; a small percentage are immature. This verifies the normal replenishment from bone marrow. White blood cells provide the body’s defense as part of the immune system. It is impossible to selectively destroy the red cells (for testing purposes) and leave only the white cells because avian erythrocytes and thrombocytes are nucleated (have a nucleus). Suppuration: (pus formation) is the result of white blood cells fighting infection. There are several types of WBC’s; they are evaluated and counted in a CBC. A high WBC count indicates disease or stress. An increase in the total white count in the presence of an elevated heterophil population is an indication of inflammation, with or without the presence of infection. Low WBC counts are observed with severe viral infections, e.g., circovirus. Juveniles have a higher white cell count than adults. Artifacts(substances in the blood not naturally present) are possible from improper handling, storage temperatures, or shipping. Buffy Coat: This is the layer of white cells that separates out at the junction between the red blood cells and the plasma after the sample is taken. Measuring the buffy coat is a quick technique for estimating the WBC count. The buffy coat should be 1% or less of the total volume of blood. A buffy coat of 2% or higher indicates a high WBC count. Leukocytosis: an increase in the WBC count. It is an increase in the WBC count. The most common causes are transporting the bird to the clinic and handling. It is a physiological response to stress. Possible differential diagnoses for leukocytosis are: bacterial infection, fungal infection, necrosis, neoplasia, heavy metal toxicosis, psittacosis, avian TB, trauma, cancers such as leukemia, and stress. Leukopenia: a decrease in the WBC count. Common causes are acute viral infections and septicemia (blood infections); the body depletes it store of WBC’s and can no longer fight the infection. The differential refers to the percentages of the different types of WBC’s; deviations from the normal range and abnormal cell characteristics indicate disease. The WBC count is useful in the assessment of progress in the avian patient. It determines if the bird is responding to therapy; there is a positive response if the levels return to normal. The count is provided with the use of a leukogram (a tabulation of the leukocytes present in a blood sample). Heterophils, eosinophils, and basophils are granulocytes because they contain colored granules (tiny spindle-shaped bodies) in their cytoplasm. These are all produced in bone marrow. Lymphocytes and monocytes are mononuclear WBC’s; they originate in the spleen and in tiny collections of lymphoid tissue throughout the body, but not in the bone marrow. These cells make up 40-75% of the WBC’s; they are the most common granulocyte in psittacines. They attack infection, inflammation and bacteria. Heterophils are the avian equivalent of the mammalian neutrophil. They exhibit toxic changes in stress or disease conditions that can be seen under a microscope. Their granules are dark red and spherical- to spindle-shaped. Degranulation indicates a low degree of toxicity; there is a decrease in the number and size of cytoplasmic granules and a change in color of the cytoplasm from colorless or light blue to muddy pink or red. Mild degranulation is normal during stress, but it’s a red flag if the total WBC count is higher than normal. During severe illness, the WBC count may rise above normal, and some heterophils may appear dark and shrunken; they may also appear foamy due to the presence of vacuoles (small cavities in the cytoplasm of a cell, bound by a single membrane and containing water, food, or metabolic waste), or they may have ruptured. If the cytoplasm contains bacteria, it is toxic. The degree of toxicity increases with the severity of the bird’s condition. A high degree of toxicity in most or all heterophils leads to death as leukopenia sets in. Severe heterophilia (a high number of heterophils) can indicate chlamydophilosis, aspergillosis, or TB, with toxic changes in the white cells. Moderate heterophilia indicates infection or cellular necrosis. Eosinophils and Basophils: These are similar in appearance to heterophils, but the cytoplasmic granules have a different color and shape, and they have a darker-stained nucleus. Their function is unclear, but increased numbers might be associated with parasitic infections, allergic reactions and significant tissue damage. Basophils: These contain dark-blue stained spherical cytoplasmic granules and exist in small numbers; the normal range is 0-5%. High numbers are associated with chronic, long-term illnesses, respiratory infections, tissue damage, early stages of inflammation, and some Chlamydiosis infections. Lymphocytes: The normal proportion of lymphocytes is 20-50%, but this varies among species. They are an important part of the immune system. Cockatiels and Amazons have more lymphocytes than heterophils. Increased numbers (lymphocytosis) are seen in chronic infections and lymphoid leukemia. A decrease in numbers indicates acute viral infection. In chronic conditions, the lymph granules take on a purple color in the cytoplasm. Reactive lymphocytes synthesize antibodies and other agents involved in the host’s immune system. Marked lymphocytosis, in which all or most lymphocytes appear abnormal or immature, is associated with leukemia. The WBC count in leukemia is greater than 100,000 cells/cu mm; most of these are lymphocytes. Monocytes: These are the largest WBC’s in avian blood; they are similar to lymphocytes. An increase in the percentage of monocytes (up to 10%) is seen with chronic diseases, such as psittacosis, systemic fungal infections, TB, and massive tissue destruction. These are cell cytoplasmic fragments that are active in coagulation (clotting). They take the place of platelets in mammals and are responsible for blood clotting. They are produced in the bone marrow and are smaller than erythrocytes. They also phagocytize or “eat” foreign material such as bacteria and carry oxygen if extreme anemia exists, just as RBC’s do. Birds with values below 37% are considered anemic; those with values below 15% may need a blood transfusion. Plasma: This is the fluid, or non-cellular part of the blood in which particulates are suspended. It is examined for color, protein levels, and the presence of parasites. It is distinguished from serum. Serum is the cell-free portion of the blood from which fibrinogen (the blood-clotting factor) has been separated in the process of clotting. Heparin is used when the blood is drawn to prevent clotting; vials that are used to collect blood for the CBC are heparinized to prevent coagulation. The plasma should be clear or pale yellow due to carotenes in the plant materials, including some seeds. The yellow color is not due to icteric plasma; jaundice (yellowish pigmentation of the skin) does not exist in birds. Jaundice is due to increased amounts of bilirubin as a result of liver disease. Birds do not have bilirubin so they cannot become icteric if they have liver disease; instead they produce biliverdin. If the color looks pink, it is due to hemolysis (the breaking down of RBC’s and subsequent release of red hemoglobin molecules into the plasma). An overwhelming infection can cause septicemia; this causes hemolysis. If the plasma appears white or milky, it is due to the presence of fat (lipemia) in the blood. Lipemia is often found if the sample is drawn after a high-fat meal, if the bird is overweight, or if the bird has liver or pancreatic disorders. Lipemia in the plasma can be seen in reproductively active females; yolk globules of fats and proteins are found in the blood. These are synthesized in the liver and transported via the plasma to the ovary where they incorporated into the oocyte (the immature egg cell). Plasma is mainly water but contains a substantial amount of protein. Plasma proteins (except for antibodies and hormones) are synthesized in the liver. transport compounds for most of the constituents of plasma. The total protein level is an indicator of the health status of the patient. Hemolysis or lipemia give falsely elevated levels of protein. The normal value is between 2.5 and 5.5 grams/deciliter (gm/dl). A low total protein count indicates chronic disease, especially liver and kidney disorders, cancer, parasitism, long-term stress, and starvation or malnutrition. Increased values indicate dehydration, chronic infection, or leukemia. 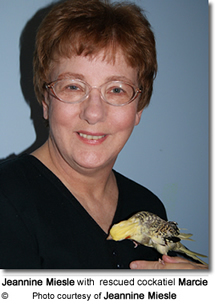 Blood parasites are usually found in wild-caught, imported birds; they are rare in domestic pet birds kept indoors. They are transmitted by blood-sucking insects such as flies, mosquitoes, and mites. The clinical signs are determined by the type of parasite and the species of bird. Most blood parasites cause no disease, so treatment is sometimes not given. Enzymes are produced by cells in various organs. Each has a baseline level. When there is cellular damage, some enzymes are released (leak out) into the bloodstream. The levels are measured as part of Blood Chemistry Panel. Abnormal counts indicate muscle damage; this test is used in conjunction with AST to differentiate between liver and muscle damage. AST: (aspartate transaminase), (SGOT) a liver enzyme; the normal range is 330 IU/L (International Units per Liter). Elevations are due to damage to the liver cells and skeletal muscle cells. Uric acid is the main nitrogenous waste in birds and eliminated by the kidneys in the urates. Elevations occur after severe kidney disease or dehydration. The normal range is 2-11 mg/dl (Milligrams per deciliter). It is the best indicator of renal health in most birds. Blood glucose levels are higher in birds than in cats and dogs. The normal level is 200-400 mg/dl. Glucose levels are elevated by stress or eating. Hyperglycemia is associated with diabetes mellitus, which is uncommon in birds. Hyperglycemia is a result of levels above 900 mg/dl. Glucose levels below 150 mg/dl are life-threatening. Hypoglycemia is rare in birds; it is not associated with starvation. The primary cause of hypoglycemia is septicemia (bacteria in the blood due to infection). Abnormal readings indicate severe liver disease, sepsis (blood infection), anorexia or pancreatic disease. Calcium’s value level is linked to protein levels. The normal range is 8-12 mg/dl. Hypocalcemia (low calcium levels) results in weakness and tetany. High levels are common in reproductively active females—as high as 25 mg/dl. Elevated levels of calcium have been associated with Vitamin D3 toxicity, osteolytic bone tumors, renal adenocarcinoma, or dehydration. Total protein includes albumin and the globulins levels. Normal values are 3.0-5.5 mg/dl. Poor measuring methods exist for albumin, so lab values are inaccurate. Electrophoresis is used instead. Decreased values indicate malnutrition, malabsorption, renal disease, or liver disease. Elevated values indicate dehydration, immune stimulation, liver disease, gastrointestinal disease, or kidney disease. This is a process used in the separation of proteins and nucleic acids; it is used to study diseases in which there are altered (abnormal) serum and plasma proteins. It is valuable in determining if the patient has an inflammatory or infectious condition; this is determined by an elevated globulin portion of the total plasma protein. It assesses the type and severity of the disease in the patient. EPH divides total protein into five fractions: pre-albumin; albumin; alpha, beta, and gamma globulins. Alpha and beta globulins are acute-phase proteins, and beta and gamma are immune globulins. Elevations in beta and gamma globulins indicate activity of the immune system, usually from infection, rarely from cancer. Elevations in immune proteins are caused by fungal, bacterial, or skin infections, or pneumonia. EPH screens for health and is used in follow-up tests for sick birds on therapy. Birds do not have bilirubin; instead they have biliverdin. Bilirubin is what gives the mammalian skin a jaundiced color. Birds lack the enzyme which converts the bile pigment biliverdin into bilirubin. Excess biliverdin indicates liver disease; the urates and urine turn a green/yellow color. No diagnostic values for psittacines exist. Bile acids are produced in the liver to aid in the digestion of fats. After they are excreted into the intestinal tract, bile acids are reabsorbed and returned to the liver via the portal circulation (the regular movement of the blood through the heart and blood vessels). The liver then extracts the bile acids from the blood for recycling. Elevation in bile acids is associated with decreased ability of the liver to extract the bile acids from the portal circulation, thus indicating impaired liver function. The test’s purpose is to determine liver function in psittacines. Samples are taken after a short fast or randomly. Normal values are fewer than 100 umol/L (micromoles per liter); more than 150-200 umol/L indicates liver dysfunction. The assay is affected by artifacts like lipids and damaged red blood cells from sample handling. This is a non-specific enzyme in birds. Elevations indicate liver disease, skeletal muscle damage, or cardiac disease. All plasma proteins, except immunoglobulins, are manufactured in the liver. Albumin is the largest single fraction in the healthy bird. It is the major reservoir and transporter of protein. It is the main contributor of colloidal osmotic pressure (pressure exerted by proteins in a blood vessel's plasma). It pulls water into the circulatory system. Albumin is involved in the acid-base balance. It acts as a transport carrier for small molecules such as vitamins, minerals, hormones and fatty acids. It functions primarily as an osmotic pressure regulator and protein transporter. Increased albumin concentration indicates dehydration or hemoconcentration (increased concentration of cells and solids in the blood, usually resulting from loss of fluid to the tissues). Decreased albumin is associated with decreased synthesis, as in chronic liver disease, dietary protein deficiency, or chronic osmotic pressure, or increased hydrostatic pressure (pressure when fluids are at rest.) Decreases can also occur with blood loss, severe inanition (exhaustion due to starvation), and chronic infection. Pre-albumin: a separate and distinct fraction that precedes albumin in electrophoresis. The only known function of pre-albumin is the transportation of thyroid hormones. It is found in the blood of laying hens, embryos and neonates. In birds, it can comprise as much as 40% of the total serum protein. The globulins are composed of three fractions: Alpha (? ), Beta (? ), and Gamma (?). Alpha globulins are a group of proteins manufactured almost entirely by the liver. The Alpha globulins elevate during the acute phase of inflammatory disease. They assist in diagnosing and monitoring many infectious disease and causes of chronic inflammation. Increased Alpha globulin levels are associated with parasitism. Alpha globulins increase with acute nephritis; severe, active hepatitis; active, systemic inflammation; inflammatory liver disease; malnutrition; lipemic artifact; systemic mycotic (fungal) disease; protein-losing enteropathies (diseases of the intestine); and the nephrotic syndrome, in which the damaged kidneys leak large amounts of protein in the urine. Decreases in Alpha Globulin levels indicate hepatic insufficiency, severe inanition, blood loss, and protein-losing GI diseases. Increases in Alpha globulin levels are not common. Increased egg production is the most common reason for elevated Beta globulin levels in birds. The Gamma globulin fraction contains most of the immunoproteins (IgM, IgA, IgE, and IgG)Elevated gamma globulins are found in birds with acute Chlamydophila Psittaci infections.Gamma globulins elevate in response to on-going antigen stimulation, usually from infectious agents.Large increases occur with acute or chronic inflammation, infection, chronic hepatitis, and immune-mediated disorders.Sharp increases occur with tumors of the reticulo-endothelial system (that part of the immune system that clears abnormal and old cells, including phagocytes, and deals with plasma cell dyscrasias.Deficiencies indicate immune-deficient states: blood loss, overwhelming infection, protein-losing GI diseases, and severe inanition. Panhypoproteinemia: all protein fractions on the EPH are decreased due to severe inanition, severe hepatic insufficiency (failure of liver function), overwhelming infection, protein-losing states (especially GI or kidney), blood loss, or third-space loss (blood loss (effusion) into the body cavity). Sarcocystitis; a parasite infection. Both beta and gamma fractions are elevated. Mycotic diseases, especially aspergillosis. The beta fraction increases in the acute phase, and beta or gamma elevations occur during the chronic phase. Hypoproteinemia: an abnormally low level of protein in the blood. Birds that are chronically infected lose the inflammatory protein response altogether. Acute Chlamydiosis/Psittacosis: a bacterial disease. Many times there are no changes in the inflammatory proteins, or else only a slight increase in the beta and gamma globulins. Hepatitis or nephritis: a swelling and inflammation of the liver or kidneys. There is a decrease in albumin levels and an increase in beta globulin levels.